GST partners with Crime Tech Solutions, LLC for marketing and promotional purposes for GST CrimeMap Pro product line. GST CrimeMap® Pro is a comprehensive crime analysis system designed for specialized crime analysts to manage the incident database and conduct a variety of mapping and analytical tasks. Customizable Search Forms - CrimeMap® Pro search forms are customizable allowing users to create search forms based on their specific needs, such as crime incidents, Megan's, parolees, MO, vehicles, suspects, field interviews, etc. 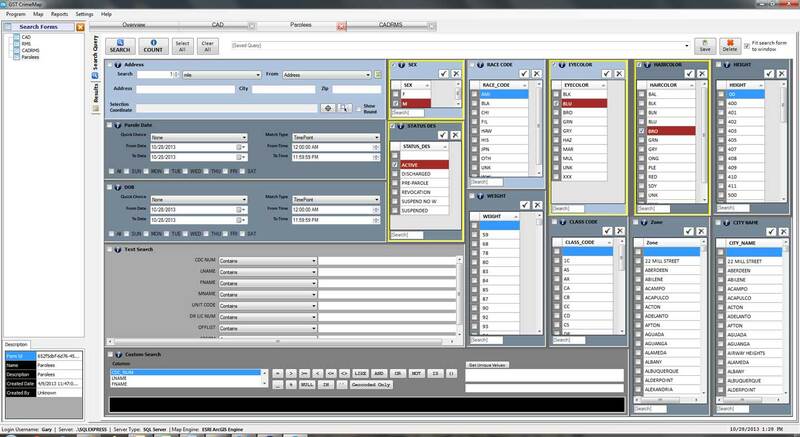 Ad Hoc Reporting Tools - CrimeMap® Pro offers comprehensive reporting tools for users to create customized reports, including text information, groupings, images, bar graphs, 2D/3D pie charts, agency logo, report summary, etc. 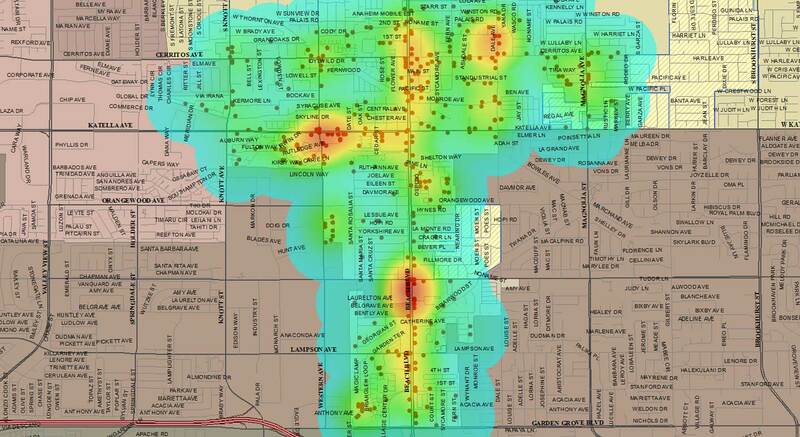 Spatial Analysis - CrimeMap® Pro offers a comprehensive set of functions to support a variety of crime and spatial analyses, and display results on ESRI ArcMap. 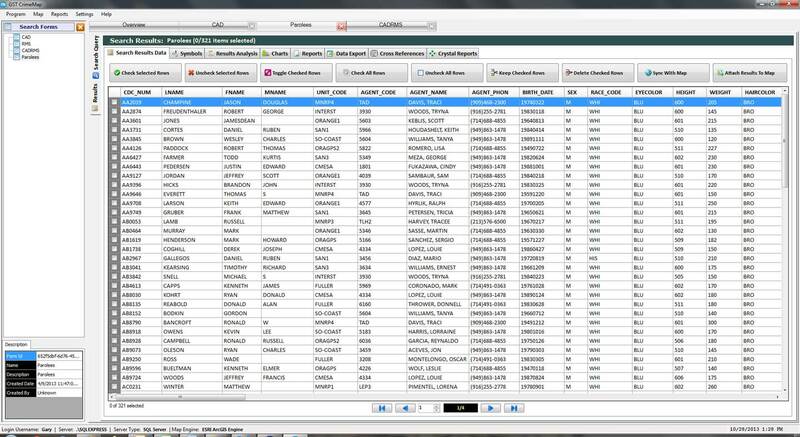 Query Builder - CrimeMap® Pro provides a user-friendly query builder for users to build their own search queries. Database Link - CrimeMap® Pro database uses Microsoft SQL Server® and allows the user to bring crime incident data from their CAD/RMS database, or import data from multiple sources such as Megan's and Parolees. Support of ESRI ArcMap - Users familiar with ESRI ArcMap can utilize all the mapping features of ArcMap. All the customized macros the user created in ArcMap can be used alongside CrimeMap® Pro. Query any table by customizable forms by date, time, day of week, area, districts, crime type, location, Point-of-Interest (POI), query statements or any attribute in the table. The selection criteria may be saved for future use. Identify records within a specified distance from an address or cross streets. Edit and geocode records (using parcel or street centerline maps or manually). View queried results in tables, graphs/charts or on the map. Cross Reference - Cross-reference among incidents, subjects, Megan's, parolee, and gang records. Hotspot Analysis - Analysis of hotspots with various methodology, such as Grid Analysis, Intensity Analysis, Outer Boundary, and Analysis of Duplicate Locations. Temporal Analysis - Analysis of temporal patterns based on either Grid Analysis or Density Analysis. Time Series Analysis - Analysis of incident patterns with time series, based on year, month, or date. Threshold Analysis - Analysis of change in the spatial pattern of incidents over time and space. Series Analysis - Constructing spatial patterns of incidents with a connection based on a user-specified field.